LAWRENCEBURG, Ind. – A former Elder High School basketball star was found slain in his home on Memorial Day, according to Indiana State Police. The body of 73-year-old Thomas Biedenharn, who also played at the University of Cincinnati, was discovered Monday afternoon on Highridge Court in the Hidden Valley subdivision, according to a news release. Evidence at the scene indicated his death was caused by foul play, and a Hamilton County coroner’s autopsy Wednesday ruled it a homicide, according to ISP. 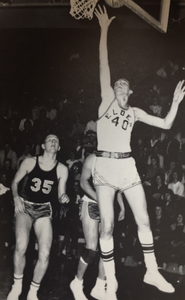 Biedenharn was a 6-foot, 7-inch junior center on the 1960-61 Elder team that was ranked No. 1 in the state and went undefeated during the regular season. The team was 20-0 before losing to Withrow in the district tournament. 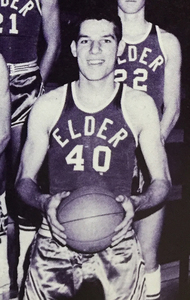 Almost 60 years later, Biedenharn still holds Elder's record for highest season scoring average (24.8), which he set as a senior in 1961-1962. "When I heard about it, my stomach crashed. I was shocked," said Tom Bushman, a starting guard on the 1960-61 Elder team. "I just walked around the house saying, 'I can't believe it. I can't believe it.'" Bushman said he taught Biedenharn's son, David, during a 40-year career as teacher and guidance counselor at Elder. Biederharn also had a daughter, Shelly, according to Bushman. Bushman said he lost contact with Biedenharn, who moved away from the west side and became a successful farm goods salesman. He said they got back in touch after Elder held a reunion for the team in 2014. 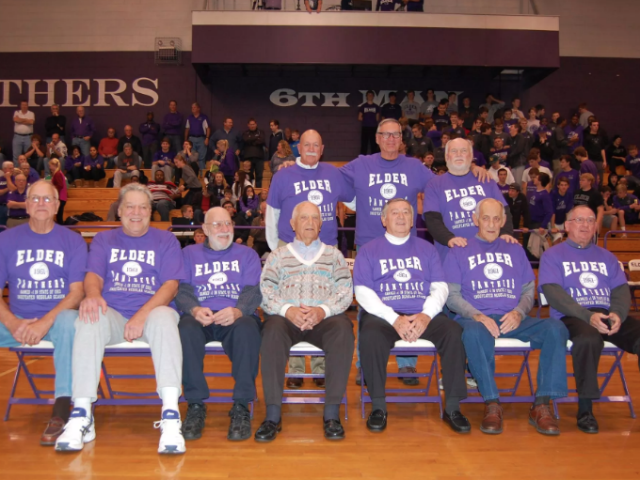 Tom Biedenharn (second from left) and 1960-61 Elder basketball team at The Pit on Dec. 9, 2014. Front: Paul Knue, Biedenharn, assistant coach Art Del Conte, head coach Ray Dieringer, Fritz Meyer, George Scherer, Tom Bushman. Back: Andy Egloff, Tom Apke, John 'Tim' Heffernan. (Provided by Elder). "You always knew when Tom was in the room," said Bushman. "He was tall, of course, and he had a deep voice - a gruff voice sometimes. But he always chuckled after it. "I didn't know this when we were in school, but I found out later that he had a great sense of humor. He liked to hold parties at the restaurant-bar at Hidden Valley. Last year's party was around Halloween and the theme was 'bring your ugliest gourd.'" At 6-7, Biedenharn was taller most high school basketball players in those days, Bushman said. But he was good shooter, too. "He was an excellent player. He could shoot like crazy," Bushman said. "He had really big hands, soft hands. Catch the ball and shoot it. "It's amazing to think he still holds the record after all these years. We had four scorers on that team. There weren't a lot of touches to go around." Biedenharn went on to play for the UC freshman and varsity teams, including the one that finished as NCAA runner-up in 1963. Elder's 1960-61 team included several players who went on to college fame. Fritz Meyer also played at UC. Tom Apke played at Creighton and later coached there. Steve Tensi became an All-American quarterback at Florida State and starter for the Denver Broncos. The coach, Ray Dieringer, became an assistant coach at UC and head coach for 11 years at Cleveland State. No arrests have been made in Biedenharn's death, police said. Anyone with information is urged to call the Indiana State Police-Versailles Post at (812) 689-5000.